food excellent with late breakfast for lazy bones,very clean, chamber maids went out of there way to accomadate extra pillows etc etc,excellent value for money, would highly recommend but not in march due to spainish having their freeby holiday and slightly took over great location near beach and shops would diffently go back but not in march,more like a 4* than 3*. great holiday. booked with broadway travel great price with private tax waiting at airport.oh and reception staff very helpfull went out way to help with buses markets etc that where on.Highly recommend. The hotel was very clean even our balcony got cleaned daily, chamber maids/cleaners very helpful. Plenty food for everyone fish meat pasta chips salad. Location was excellent 2mins from beach and shops. Reception staff very helpful telling us what markets where on and what buses to get. Daily and nightly entertainment but March not to great as was all mainly spanish, but still joined in after few cocktails all in all great holiday and will be going back. Although this is the fourth time we have stayed in this hotel we were totally disapointed in how much things had changed. We found the food totally unacceptable, we had to eat out most nights as we could not find anything on the buffet to eat. Trying to get served at the bar was atrocious we waited between 45 and 60 mins, everybody except us were all inclusive.The evening entertainment was farcical by the hotel entertainment team, the day time activities seemed to happen when they felt like it. The rooms although clean are desperately in need of refurbishing. We were so disapointed in everything that we decided to cut short our holiday and booked flights home. Hotel on a side street on a flat part of the resort very close to all shops, resturants,bars and the beach.Hotel very clean and comfortable, rooms are carpeted so minimises the noise from rooms above , we had a room on the second floor right above the front entrance which was fun you could watch who was coming and going.We were halfboard so only had breakfast and evening meal which were ok always hot but a bit repetative.drinks are quite expensive at bar so we used to go out most of the time to one of the many bars resturants in resort.Didn,t have a lot of contact with hotel staff but they did seem a little grumpy, the resturant staff shouted at us the first night for sitting at a table made up for four when there was only two of us.What we saw of the entertainment was really poor, the hotel was full of old people and german families so maybe it was geared just for them.I would visit this hotel again just for its location and how comfortable it was, would not go AI though you would miss too much going on in resort. Stayed for one week at the Pionero. The hotel was clean and modern, maybe a little lacking in air conditioning, with plenty of space. The food was very good, with a large selection at both breakfast and dinner. Most tastes were catered for, and all ages seemed to be enjoying the food. The location was brilliant, just a short stroll from the beach and shops, but far enough away to be quiet. Some staff were great, and a few not so great. Overall I can't fault them. The entertainment was the usual stuff, but seemed well supported by guests. The flamenco dancers were superb. I would definitely visit the Pionero again. Beautiful hotel, quiet location but feels like a million miles away when your sauced! Very clean but a few mornings the maids walked in even when there was a d.n.d. sign on the door also the fridge in the room was broken and the aircon wasn't the coolist. The reception staff were quiet old and grumpy so not a place for the young and lively. the food was a disgrace!!!! You could have veal or veal or veal!! It was as if only the Germans were being catered for. The one redeeming factor for this hotel was the my travel rep, Debbie. She was so helpful and acted as tho she really cared instead of fobbing us off with easy answers. Although we only stayed a few nights at this Hotel, as we spent the first part of the holiday in Cala Millor, we were very disappointed with the food and the attitude of some of the staff. In Cala Millor we stayed at the sister Hotel Acorn Borneo which had a better choice of food & even had ovens baking fresh bread in the restaurant. The staff allowed us to choose our table, which we could use for the rest of our stay, and the reception staff could not do enough for you. Each morning a man would walk around the restaurant with a clip-board, asking pointless questions, while we trying to eat our breakfast. On our last night we rang reception & asked for an outside line, so that we could call home. We were told that as we were going home the following day it would not be possible to use the telephone (presumably, in case we 'did a runner' without paying the bill) we couldn't believe it! 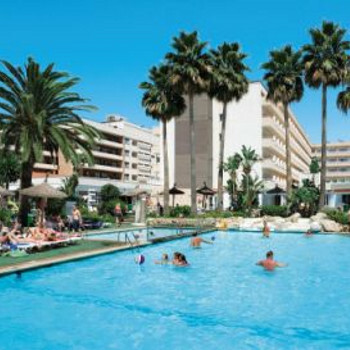 The Santa Ponsa Park hotel is situated a few minutes walk from the beach. The hotel was modern with spacious rooms and very clean. The entertainment staff were very helpful and cheerful and always were around with games and activities to do during the day. Unfortunately that is where the goods things end. The food was of the worst I have tasted while on holiday and there was not much choice. The staff in the hotel were very unfriendly and unhelpful. The reception staff were grumpy and the restaurant staff didnt want to know. One one occassion a waiter dropped a plate with food on it and this was not removed till a supervisor appeared some 5 minutes later. The bar staff were only interested if you were paying cash (we were on all inclusive basis). Needless to say no tips were left at the end of the week. This is not a hotel we will return to.